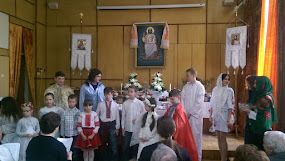 Ladies of the Resurrection Lutheran Church in Kyiv had their regular Bible Brekafst today. Tasting coffee, tea and sweets they were exploring "Martha, a Generous Hostess of Bethany" topic. After studies of the Old and New Testament Scriptures (Proverbs 31, Luke 10:38-42 and John 11:17-44) sisters in Christ not only have strengthened their faith but also have discussed how to get their priorities right, especially in the season of Lent.